UNITED NATIONS, September 24 -- As the UN's Sudan meeting ended Friday night, African Union Commission President Jean Ping and top UN Peacekeeper Alain Le Roy took questions from the Press. The Communique just issued differed slightly from the near final draft Inner City Press exclusively put online earlier on Friday. Among the changes: the phrase “human rights” was cut from the final paragraph. Inner City Press is putting the final Communique online here. Inner City Press asked if the border demarcation and Abyei issues including regarding oil would be resolved before the January 9 referendum date. Le Roy said “hopefully” they would be resolved. Jean Ping intervened to, essentially, instruct the Press to not be negative, like predicting an earthquake. About Darfur, Inner City Press asked what Le Roy was doing to ensure that UN Peacekeepers can and do leave their bases and protect civilians, as did not happen in the Tarabat Market earlier this month. 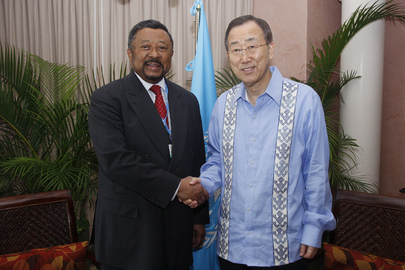 Le Roy said things are getting better, and to the side of the stakeout UNAMID chief Ibrahim Gambari nodded vigorously. Inner City Press asked why UN Secretary General Ban Ki-moon had Gambari and his UNMIS counterpart Haile Menkerios go to the inauguration of Omar al Bashir, indicted by the International Criminal Court for war crimes and genocide. Le Roy began the party line -- the Secretary General takes accountability seriously -- when Jean Ping broke in to chide those who are only about accountability. Peace is important, he said. The AU's position is clearer than the UN's. Watch this site. UNITED NATIONS, September 24 -- The open portion of the UN Sudan meeting was as surprising for what was not said as for what was. US President Barack Obama in his ten minute speech did not once mention Sudanese President Omar al Bashir, indicted by the International Criminal Court for war crimes and genocide. Inner City Press was allowed in the meeting for the first four speakers, and got the first copy of Taha's prepared speech. That the praise of Obama was in the prepared text may imply that Taha and his government knew that Bashir would not be mentioned. Similarly, after US Secretary of State Hillary Clinton met with Taha earlier in the week, Inner City Press asked her spokesman PJ Crowley if Bashir, and specifically whether he would require a meeting and photo op if the UN Security Council visits the country as initially planned on October 4 to 11, Crowley said Bashir “did not come up” in the meeting. 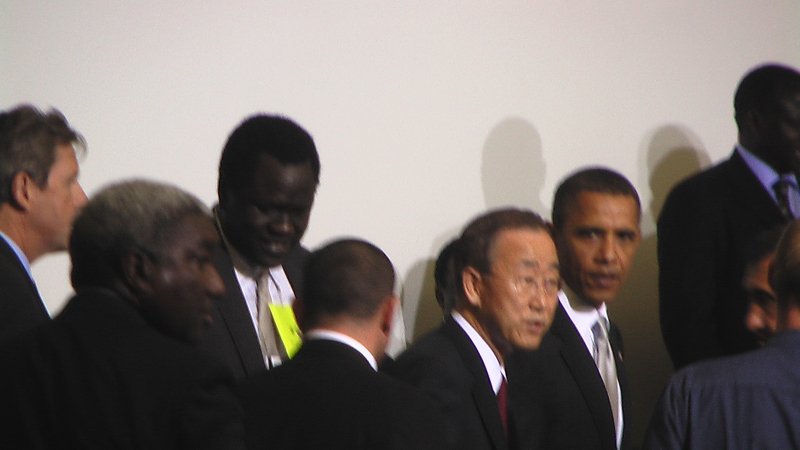 After being asked to leave Friday's Sudan meeting after Ban Ki-moon, Obama, Taha and Salva Kiir spoke, Inner City Press asked a Security Council Ambassador if any progress had been made on scheduling the Council trip to Sudan, which members such as Austria and Mexico want. No, the Ambassador said, maybe after the meeting. Asked by Inner City Press about Obama not mentioning Bashir, the Ambassador nodded and added, “it will be interesting to see how many of the African heads of state present mention Bashir and how.” Yes, it will. Rwanda's Paul Kagame left the meeting after the first four speakers, as did Nick Clegg of the UK. The EU's Catherine Ashton left while Salvia Kiir was talking, after having sat near the back of the room typing on a laptop. It is expected that top UN Peacekeeper Alain Le Roy will take questions from the Press after the meeting is over and the Communique is issued. "This draft communiqué is the very embodiment of international helplessness and lack of commitment to the cause of a just peace for Sudan. In tone it barely rises to the level of mild exhortation. In substance it is vacuous, or at least entirely redundant, given what the UNSC and international actors of consequence have said previously. And some of this is downright pernicious, e.g., the celebration of the “Government of Sudan’s new strategy for Darfur.” .. This “New Strategy” has been rejected by the rebel groups, by the SPLM, and by Darfuri civil society; it has been endorsed by Gration and Mbeki, and with this document, by the UN. It is utterly shameless capitulation before a move that promises explicitly to demote the peace process (Doha or elsewhere), and to “domesticate” that process…such a “strategy” implemented will be the peace of the dead. More like a 'final solution.'" At Friday's noon briefing at the UN, Inner City Press asked Ban's spokesman Martin Nesirky to describe the role of the UN Department of Peacekeeping Operations and Department of Political Affairs in the Communique. Nesirky, who should answer this question, has yet to. Watch this site. UNITED NATIONS, September 24 -- This afternoon's closed door meeting on Sudan at the UN has been presented as a watershed, a highlight of this year's UN General Assembly. US President Obama's “14 minute speech” has been hyped by his Special Adviser Samantha Power, when Inner City Press asked why Obama had not mentioned Sudan in his General Assembly speech. The UN Secretariat has bragged to reporters about its role in putting together the Communique to be issued after the meeting. Inner City Press has obtained a near final draft of the Communique and it putting it online here in advance of the meeting. Of its 14 paragraphs, three deal with Darfur and one with Eastern Sudan. The Communique is a surprisingly weak statement, human rights advocates say. “How could this be the highlight of the US' involvement?” one asked Inner City Press. Sudan's Vice President Taha will participate in the meeting, and is slated to speak to the Press afterward. The day before, Inner City Press asked African Union Commission President Jean Ping what the AU hopes to come out of the meeting. Less than four hours before the meeting, Inner City Press asked Nigerian president Goodluck Jonathan what if he thought the meeting -- and by implication, the Communique -- dealt sufficiently with Darfur, where Nigeria has peacekeeping battalions controlled by former Nigerian diplomat Ibrahim Gambari. 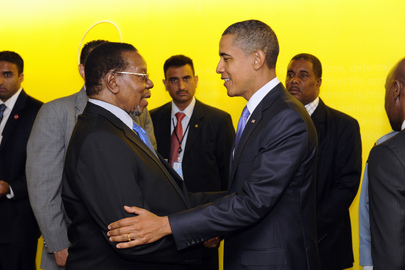 Obama & AU president, Sudan not seen in speech, Darfur hardly in meeting? President Jonathan spoke about Darfur but also about the referendum, saying that the borders should be clear before the vote, scheduled for January 9, 2011. It seems unlikely that the borders, much less the division of oil revenue, will be decided before then. While the US “big foots,” as one advocate put it, nearly unilaterally stalling a planned Security Council trip to Sudan due to a reticence for the US Permanent Representative to meet or take a photo with Omar al Bashir, smaller non-Permanent Council members try to do what they can. Mexico is on record as favoring the Council trip to Sudan, even if “some P-5 Ambassadors stay in their hotel rooms.” Austria has offered legal expertise to both sides, in meetings Friday with Khartoum's foreign minister Ali Ahmed Karti and two ministers from South Sudan.